During the 60-day session, bills passed to transition the state to a low-carbon electricity future and empowering the state’s Conservation Division to punish operators. A proposed four-year moratoriumon hydraulic fracturing failed to move out of the Senate Conservation Committee in late February. This is the third in a four-part Western Wire series. You can read the first part here, and the second part here. Overall, the state has seen a dramatic improvement in education outcomes thanks to significantly higher education revenues, according to Chris Ruszkowski, the former Secretary of the New Mexico Public Education Department under former Gov. Susana Martinez. The former middle school social studies teacher has worked for governors on both sides of the aisle and noted that the bipartisan success can be illustrated in his state. “Over the past several years, including this legislative session, both the legislature and now two governors have been able to quadruple the number of students enrolled in pre-K and early childhood education,” Ruszkowski told Western Wire. On March 19, New Mexico’s Public Education Department released graduation figures for the 2017-2018 four-year graduation rate. “New Mexico’s official 2017-2018 four-year graduation rate was 73.9 percent, an all-time high. This figure is nearly three percentage points higher than the 71.1 percent four-year rate in the 2016-2017 school year. Graduation rates increased across all student subgroups, including Hispanic and American Indian students, students with disabilities, and English learners,” Public Education Secretary Dr. Karen Trujillo, Ruszkowski’s successor, announced. The short- and long-term improvements were no surprise, Ruszkowski said. “It’s a testament to the fact that the previous administration was incredibly responsible about growth and about nurturing and investing in a healthy economy, and now this legislature and this governor reap the benefits of that and are able to make significant investments in K-12 education,” he said. The 2017-2018 graduation rate is a stark contrast to the statewide numbers from just a decade earlier. New Mexico has seen a 20 percent increase in those ten years, since the state began tracking the graduation data. Revenues have surged as New Mexico skyrocketed to the top of the rankings in oil and natural gas production at 3rd in the U.S. in crude oil production and 9th in natural gas output, according to 2017 figures from the Energy Information Administration. The booming Permian Basin helped push funding for education over $1 billion in 2018, with $822 million for K-12 education and an additional $241 million for higher education, a $128 million jump in just one year. 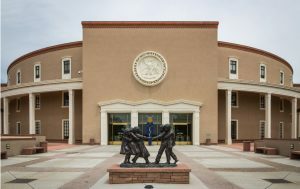 That educational bounty has directly benefited New Mexico’s schools, as other education experts have told Western Wire. Ruszkowski acknowledged that the positive cumulative effect of good policy driving industry investment and revenues that could then be re-invested in education could also see a reversal if new policies affect funding five or ten years from now. “When we talk about the cumulative effect of how we’ve built a foundation in our public education system and in our broader public and private sectors over the past decade, what you have right now is a legislature and a new governor that have been able to build upon the foundation that has been established over the past decade. The opportunity now for the new administration and legislature is to continue to build upon that foundation that brought us out of the recession,” Ruszkowski said. “When we raise the bar, when we increase expectations, then you want to match that with increased investment and increased resources,” he said. A change in the state’s regulatory framework could negatively impact the state’s energy sector and that could pose a threat to future education revenues if areas like the Permian Basin are endangered, for example. Ruszkowksi urged policymakers to think about children born today that would be graduating around 2040, and insisted that pre-K and K-12 funding and even higher education opportunities two decades from now should be considered when confronting new legislation, such as the four-year fracking moratorium that did not gain traction this session. “A child a born today is going to graduate college in 2040. And so, responsible, thoughtful government and responsible, thoughtful policy-making is going to require stable revenue sources for that child and their family over the next 22 years,” Ruszkowski said. “And as we look out across that horizon, in New Mexico the energy sector is a third to a half of that, so continued health in that sector, continued growth in that sector, and continued diversification in that sector is going to be essential,” he concluded.